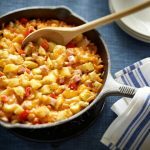 Potatoes have more uses than you could ever imagine and are readily available all year long. They are versatile, convenient and nutritious. With so many varieties, flavours and textures – potatoes are exceptional with many different cuisines. From adorning robust British dishes to swimming in Indian curries and spices, potatoes are always a hit. Canadians love potatoes. 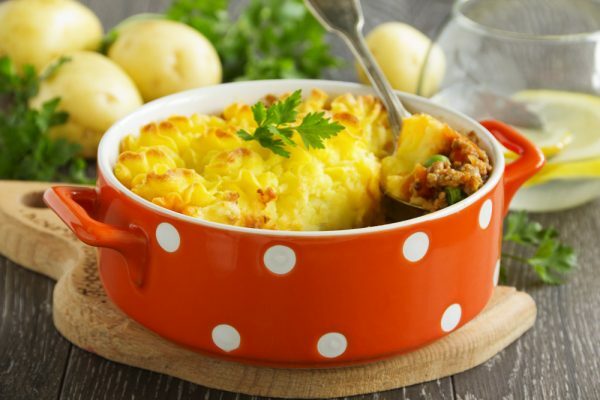 Favourite preparation methods include mashed, roasted and baked – either alone or in a casserole. However, it’s important to choose the right potato variety to ensure a quality eating experience. Here’s a quick overview. Baking Potatoes: These starchy potatoes generally have a very thick skin. 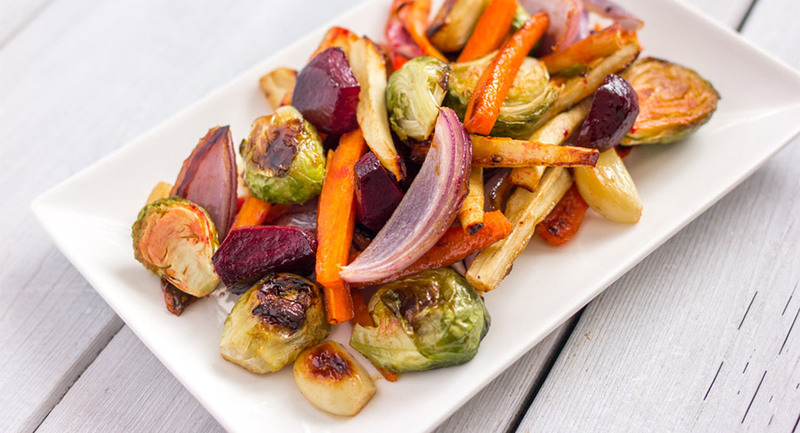 When they cook, their texture becomes dry so they are perfect for light and fluffy baked and roasted potatoes. Because they fall apart when cooked, they make a great thickener for soup. 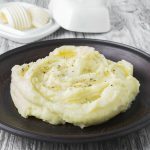 Traditionally, they have been recommended for mashed potatoes but because they are absorbent, unless they have a lot of butter and cream added to them – the mash they make can be gluey. For today’s palate, a white or yellow potato is better suited to make smooth, mashed potatoes. Examples: Russet Burbank, Russet Norkotah, Frontier Russet and Shepody. Also called Idaho potatoes. 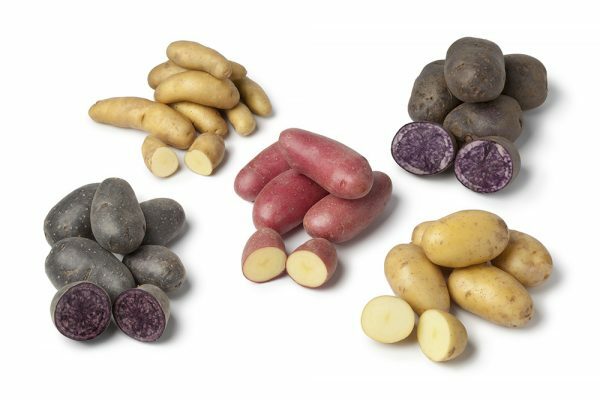 Yellow, white and red potatoes have less starch than bakers. They usually also have a thinner skin, and can be boiled, baked, roasted, steamed, pan fried, and grilled. When these potatoes cook, they hold their shape well, making them a good addition to a potato salad, soup, or stew. Whites are usually large, round or oval with light to medium skin and white flesh. They are very versatile and taste delicious boiled, steamed, mashed, French fried, roasted, scalloped, and au gratin. Red potatoes have rosy red, thin and somewhat glossy skins. They tend to hold their shape very well when cooked and are well suited for roasting, boiling, steaming, baking, sautéed, salads and soups. Examples: Chieftain, Rideau, Norland and Sangre. Yellow fleshed potatoes are round or oval in shape with light gold, thin skin and light yellow flesh. Examples: A Yukon gold is perhaps the best known yellow potato and is considered to be among the best all-purpose varieties. It has a golden buttery flavoured flesh. Make sure you pick the right potato for the right recipe! When picking them, choose ones that are firm and have a good shape and are free from excessive marks and blemishes. Avoid those that have bad spots, are a bit wrinkly or have sprouts popping out of them. Avoid potatoes that have a green skin. Dispose of any potato more than half of which is green, as it will be bitter and inedible. Don’t store potatoes in a closed plastic bag as they need to breathe. It’s best to keep potatoes in a cool, dark place to maintain their quality. 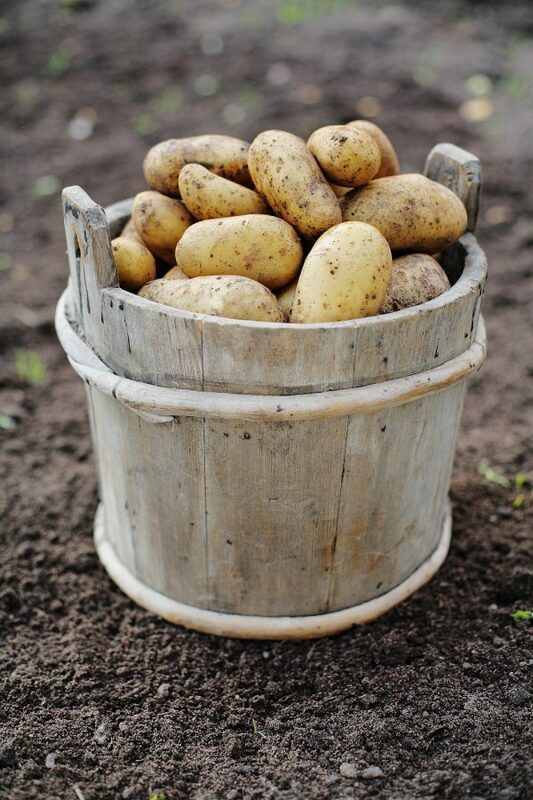 Most varieties of potatoes can last a long time (up to two weeks) if stored in a cool and dark place with good ventilation. Whether boiling, roasting steaming, mashing or baking, make sure to scrub your potatoes well and dry with a paper towel. To prevent the flesh of the potato from darkening on contact with air, cook it as soon as it is cut or place it in cold water until you are ready to use it. This brief soaking will also prevent the potato from falling apart during cooking (use fresh water for cooking). Use an 1/8 teaspoon to remove the eyes from the potato. Choose potatoes that are all about the same size – this will ensure they are all cooked and ready to eat at the same time. The smaller you cut your potatoes pieces for boiled or mashed potatoes the quicker they’ll cook. That said, the skin of a potato holds a lot of nutrients so if you are able to keep them on, all-the better! Even better, rustic style mash (that includes the skin) is delicious. When mashing potatoes, allow the potatoes to steam dry in the pot you boiled them in over low heat for 1 to 2 minutes. This will remove any excess water so you have a drier, lighter mash. If you’re making a lot of baked potatoes, use a muffin tin. The potatoes placed in a muffin tin will make it easier to move the potatoes in and out of the oven. To quickly cook potatoes on the grill or stove top, par boil them for about 5 minutes first to speed up the cooking process. Boiled potatoes: Potatoes should be boiled whole with their skins on, in a pot of water that covers them. However, if you keep them whole, they must be a consistent size or they will cook unevenly. Keeping the skin on also helps to trap in the goodness and prevent it from being lost into the water. If you keep the skins on for cooking, it is also advised that you serve the potatoes with the skin on as removing the skin from hot potatoes can be challenging and painful! That said, potatoes cut into even, small pieces will boil quickly – usually in about 15 minutes. If you do this, try to use the water in a sauce or gravy. Cooking times will depend on the size of the potato, but you will know your potatoes are done when you can easily stick a fork into them. Here’s a tip: Add your potatoes to the water before it starts boiling. This will help them cook evenly. Placing cut potatoes into the water quickly will also prevent them from browning slightly which happens when they are exposed to air. Potatoes absorb water when they are boiled, so seasoning the water with salt will enhance their flavour. Keep an eye on your potatoes as they cook and add liquid if the water level gets too low (there should always be enough liquid to completely cover the potatoes). Steamed potatoes: Steaming is a recommended method for thin-skinned, smaller potatoes. 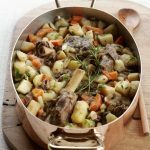 It is attractive and retains as much flavour from the potatoes as possible. When you steam potatoes, pour boiling water from your kettle into the bottom of a pan fitted with a steamer (or you can boil the water in the pan). Alternatively, use a steamer and follow the directions for it’s use. For stove-top steaming, place your potatoes in the steamer when the water is hot, sprinkle lightly with salt, replace the lid and steam over low heat for approx. 15 min. for small potatoes. Larger potatoes will take longer, up to 35 minutes. Potatoes cut into ½ inch-thick slices are even faster, 8-10- minutes. When the potatoes are cooked, drain them and return them to the pot, covered with a clean tea towel for up to five minutes. This will help absorb any excess water. Oven-baked potatoes: Russet potatoes are the best for baking, as they have thick skins and have a starchy interior which has a sweet flavor and fluffy texture when baked. Russets are also typically fairly large, which makes for an ideal serving size. However, because they are absorbent, russets are not usually recommended for casseroles like scalloped potatoes. Heat the oven to 425°F. 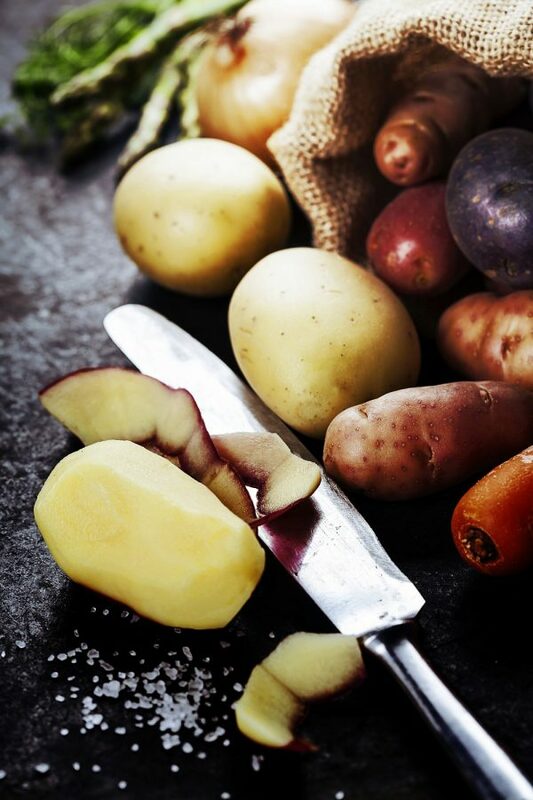 Scrub the potatoes under running water, remove any eyes, and trim off any blemishes with a pairing knife. Prick the potato with a fork a few times, this will allow the steam to escape. Cook potatoes for about 45 minutes, flipping them over every 20 minutes. Depending on the size of the potato the baking time will change. Potatoes are done when the skins are dry and they can be easily pierced by a fork. 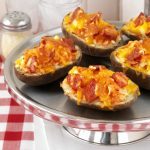 Microwave-baked potatoes: Pierce the whole unpeeled potato several times to allow the steam to escape during cooking, and place it on a paper towel. Cook it on high for 3 or 4 minutes (if microwaving more than one potato at a time, then increase cooking time). If the microwave does not have a turntable, turn the potato once during cooking. Let the potato cool for 2 minutes, wrapped in a paper towel, before serving it. 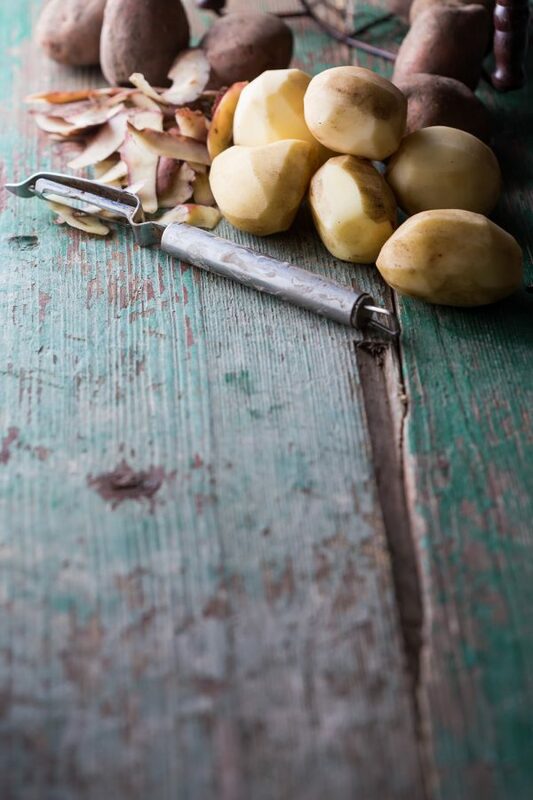 How to Freeze: We do not recommend that you freeze fresh potatoes however, once cooked, they can be frozen in an air-tight container and enjoyed later. 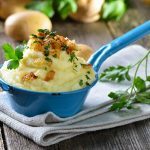 Potatoes go well with: Bacon, onions, cream, milk, eggs, garlic, curry powder, bay leaf, beef, butter, cauliflower, cheese, chicken, eggs, leeks, mayonnaise, mushrooms, mustard, oil, parsley, parsnips, pepper, rosemary, salt, sour cream, thyme, and cheese. Pan fry chopped leftover baked potatoes with onions and garlic for a tasty morning treat to have with your eggs. Add raw potato chunks to stews and hearty soups for the last 20 minutes of cooking. Use cooked potatoes in quiches, meat pies, omelets, soups and salads. 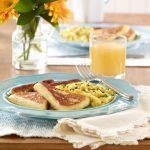 Combine leftover mashed potatoes with chopped green onion and bell pepper, then shape into patties and pan-fry in butter or olive oil. In a 2013 study about potatoes*, the majority of respondents said that they do not believe potatoes to be “nutritious”, nor “a good source of energy”! Unbelievable! We here at Produce Made Simple know that this incorrect misperception needs to be laid to rest. Potatoes are naturally fat free and low in calories. A medium sized potato (150 g) is just 110 calories and really helps to satisfy your hunger. You might be surprised to learn that it even has 3g of protein. Did you know that potatoes are also gluten free? That is of course when they are prepared carefully, without any food cross contamination. Potatoes are an excellent source of potassium, a good source of vitamin C and a source of fibre and folic acid. Potassium: Move over muscle cramps! Potatoes are among the best natural sources of potassium you can get! A medium sized (150 g) baked spud with the skin has 750 mg of potassium. This is 22% of your daily value requirement. Vitamin C: One medium potato (150 g) contains 50% of your daily requirement for Vitamin C. However, make sure you don’t cook away the vitamins. Vitamin C is a water soluble, so boil small potatoes whole to trap the “C” inside. If you boil peeled potatoes, the vitamin C will escape from the potato and into the water. If you use this method, we recommend you use the minimum amount of water and then use it in a sauce, gravy, soup or stew. Baking or roasting potatoes with their skin on also keeps the vitamin C in the potato. 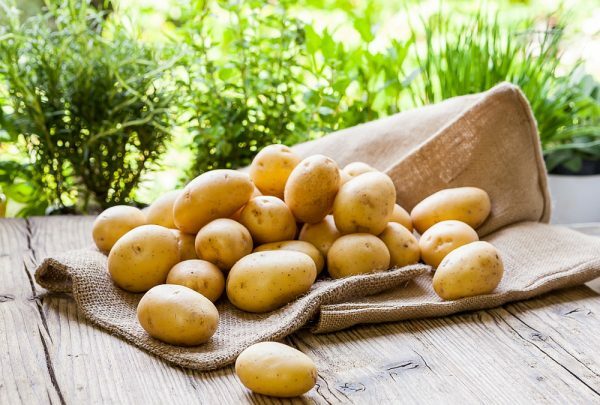 Fibre: One medium potato contains 2 g of dietary fibre and by eating the skin, the dietary fibre increases to 2.5 g. Fibre is important to wellness because it improves digestive health and has been shown to prevent some disease and weight gain. 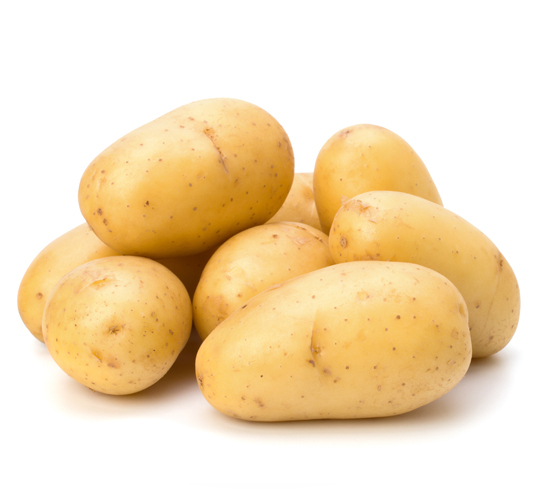 Potatoes contain soluble fibre that can be digested by your body. Eating foods that are a source of fibre will help you feel fuller, longer. Folic Acid: One medium potato contains 5% of Daily Value and if eaten with the skin, the folic acid content increases to 7% of Daily Value. So go on, enjoy potatoes because they are delicious and satisfying and know that they are also a healthy contribution to your meal. *The 2013 potato study was a collaboration with the Ontario Potato Board, Loblaw Companies Limited, Downey Farms, the Value Chain Management Centre and George Mitges & Associates.